The Natural Dog Training Blog is the web’s most comprehensive resource on the art and science of Natural Dog Training, visited by thousands of dog lovers per month who use the technique personally and professionally. 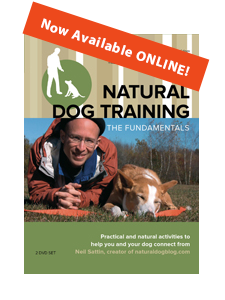 Neil Sattin is one of the nation’s leading experts in Natural Dog Training. Sattin began studying Natural Dog Training through an apprenticeship with Kevin Behan, Natural Dog Training's creator, after being told by a prominent trainer that his beloved rescue dog Nola should be euthanized because of her aggression. Today Neil leads private lessons, group lessons, demonstrations, and weekend workshops. After designing and producing an ultra-long, ultra-durable, high-visibility training lead, he produced the Natural Dog Training series of DVDs to help dog owners learn the techniques at home, without a professional. Neil lives outside of Portland, Maine with his wife, two children, three cats, and of course his dog Nola. Natural Dog Training was established in the 1980s by Kevin Behan based on the philosophy of using a dog's emotional interaction with the world, in particular their prey drive, to elicit obedience and solve problems like aggression and hyperactivity. Behan, Sattin and other proponents of Natural Dog Training strive to make the human the most attractive object in the dog’s emotional universe, and avoid negative reinforcement or intimidation, unlike other training techniques. If you're curious, you can read all about Neil Sattin's journey to becoming a dog trainer, and then dive into the articles for more in-depth training information.